A Bit of Sass: Rebecca Taylor Pleated Leather Skirt, Yes Please! 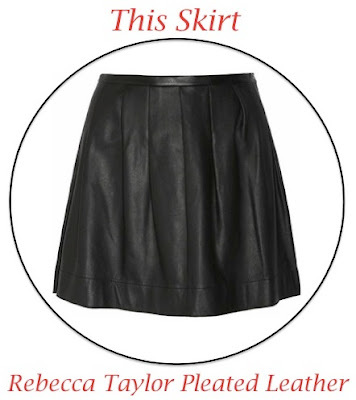 Rebecca Taylor Pleated Leather Skirt, Yes Please! I love the later outfit! I really am a sucker for cowlneck sweaters, I will wear them till I die and my kids call me old fashioned because they are so out of style. I love this skirt too, so beautiful. Oohhhhhhhhh that Rebecca Taylor leather skirt is BOMB! Great find! Yup. Adding that to my list. LOVE that skirt - especially with that sweater and high boots - great combo! I've always wanted a leather skirt/pair of shorts. You can do so much with styling them. So obsessed with that skirt! Love the way you styled it! Have you talked yourself into it yet? DO IT! It's absolutely stunning and will be in your wardrobe forever! Yes, please on all of your fall picks! They are great!! Just joined your blog and would love for you to join ours. We have our fall picks up each day this week and next. Love those Brian Atwood Flats and THAT leather pleated skirt!! I love leather skirts. Rebecca Taylor is such a talented designer. this is such a gorgeous skirt..thank you so much for commenting on my blog and following me on GFC and bloglovin..I follow you back on GFC and bloglovin and I also follow you on twitter, it would be great if you followed me on twitter also..thanks:)!! That skirt is amazing, i've been on the hunt for one for a while now and this seems to be the perfect one! You're blog is gorgeous and so are you! Now following you. wow. the combinatuon is very good and i find your blog very interesting. I'm a new follower, can't wait to see more of your posts! This idea is so amazing, I love the turtle neck jumper with that leather skirt, so chic and fall! great pieces! I love that caramel cashmere sweater! I have been contemplating a leather skirt purchase all through winter but couldn't find one I really liked. This post has convinced me the purchase must happen. The Rebecca Taylor skirt is gorgeous!! Nice Blog! The skirt is beautiful. I am absolutley obsessed with leather! As soon as the weather gets a bit cooler I am going to be rockin' some! This Rebecca Taylor skirt is stunning! Oh you are killing me, I want it to be fall right now! Hello lovely, did not know your blog is fantastic. You have great style, I like your looks, you're very pretty. I invite you to meet my blog, I hope I draw your visit. I want a leather skirt too! Thank you for the nice comment! Following you! Would be great if you like and follow mine too! Love this! I so want to be able to pull off a leather skirt. the fall board looks like it's going to be turning heads soon! Gorgeous outfit around that leather skirt. So well done. Love both looks that you created around this skirt! Such an amazing leather skirt! Thank you so much for commenting on my blog! I love this outfit inspiration. I am in love with my leather skirt. Hope to see you on THSD again soon! Chic collage....I really am searching for the perfect leather skirt & this one is just MARV!!! Love this wish list! Especially the leather skirt and flats. Great blog! That leather skirt is a total must. I have it featured on my fall must have list as well! desperately needing a leather skirt for fall!